To mark the Countdown to the 100th Anniversary of the Tibetan Proclamation of Independence, a re-creation of the Proclamation, produced by Students for a Free Tibet, will be unveiled in Dharamsala. The year 2013 will mark exactly 100 years since Tibet proclaimed the restoration of its independence. The Manchu army sent troops to Tibet 1909, prompting the 13th Dalai Lama to escape to India. However, as the Manchu dynasty succumbed to a Chinese revolution, Tibetans seized the moment and expelled the Manchu troops from Tibet. The 13th Dalai Lama returned to Tibet and issued a proclamation to mark the restoration of Tibetan independence. The text of this proclamation has survived, though the original document did not. 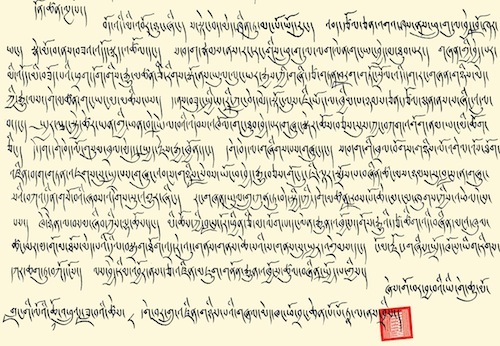 Students for a Free Tibet has created a faithful reproduction of this historic document, which we will launch this month in celebration of the 100th anniversary of the Proclamation of Independence. 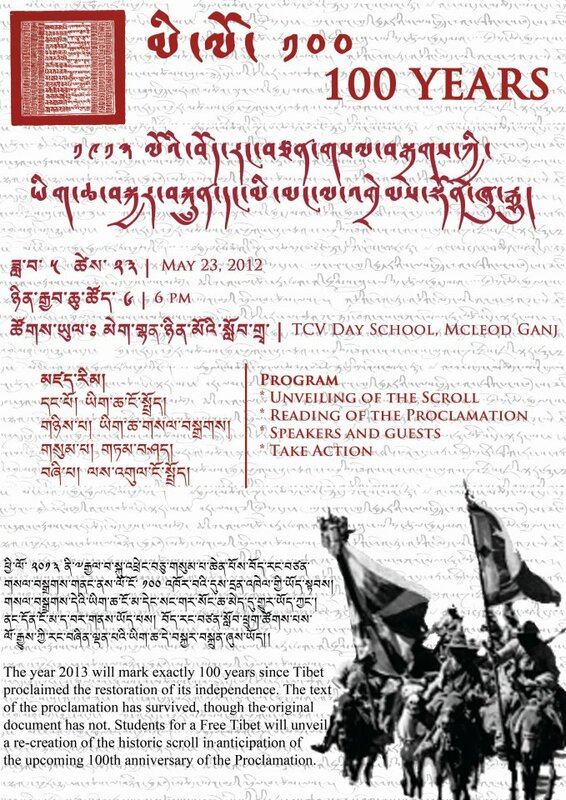 On May 23rd, SFT will hold a ceremony in Dharamsala where the scroll will be unveiled. Our goal is to have this scroll distributed in 100 cities – delivered to Chinese Embassies, presented to world leaders, plastered on global landmarks – by March 10, 2013. The “Declare Independence” campaign will be waged in three phases. During Phase I, we will encourage Tibetans and supporters to declare cultural independence from China by promoting Tibetan language, arts, literature and culture. During Phase II, we will encourage Tibetans and supporters to declare economic independence from China by boycotting Made-in-China products. In Phase III, we will ask our members, Tibetans and supporters to deliver copies of the Independence Scroll to world governments, leaders, parliamentarians, etc. Phase I of this campaign will start on May 23rd. We urge all of our members, Tibetans, friends and supporters to join the countdown to this historic anniversary by taking the following actions, and send us photos and videos that we can post on SFT’s website. 1. Hold a rally in a public area and read the Proclamation out loud through a microphone. The text is pasted below. 2. Organize a history talk on the 1913 Declaration of Independence issued by the 13th Dalai Lama. 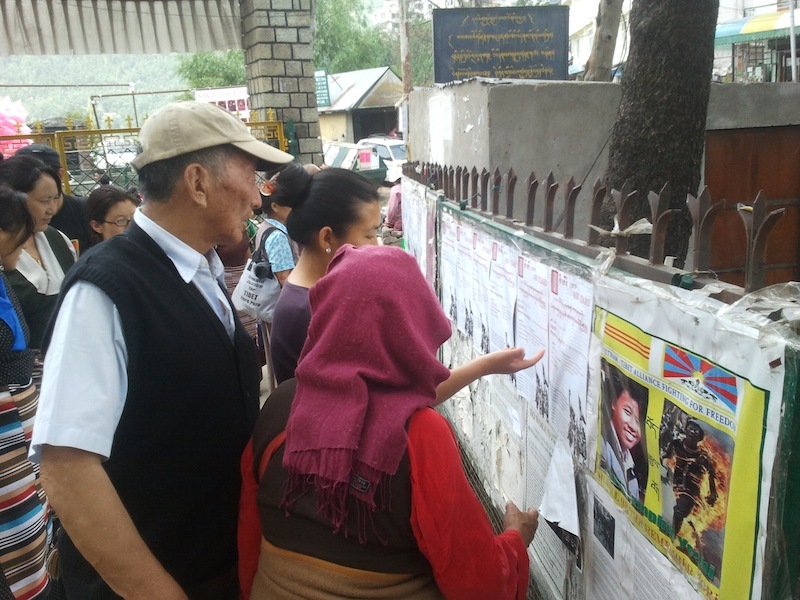 Invite a Tibetan elder or historian to your community or campus and ask them to speak about their memories or knowledge of Tibet as an independent state before 1949. 3. Paint or write the text of this Proclamation on a wall, building, street or any blank space in a public area.